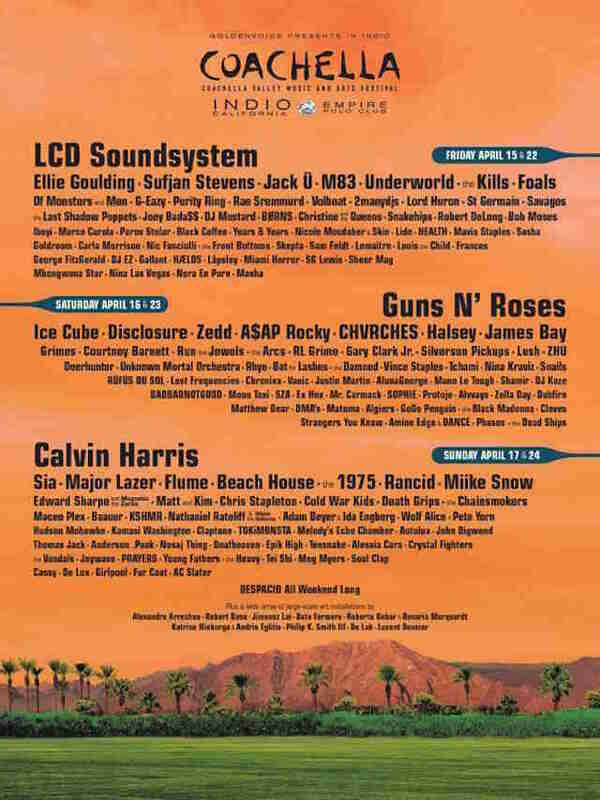 The Coachella lineup juuuuuuust dropped and man, it's a doozy. In addition to expected headliners LCD Soundsystem and Guns N' Roses (whose lineup still remains a mystery, though it's expected to be a reunion of the Use Your Illusion-era band, with Slash, Axl, Duff, and Matt Sorum playing together for the first time since 1993), the bill (which runs both weekends, April 15-17 and a repeat April 22-24, at the Empire Polo Field in Indio) includes its first-ever electronic headliner in Calvin Harris, who packed the mainstage field in an early-evening slot just a couple of years ago. Scroll down for the full lineup, commentary, and ticket info. In other big news, notoriously reclusive diva Sia will be performing her first full-scale live show in over five years on the Sunday of each weekend, and long-absent chill-out act St Germain will also make a return to the stage at the fest. Electronic music fans have more to celebrate than the Calvin Harris booking: Disclosure and Jack U are among the top-billed names this year. Newcomer pop-indie-rock breakthrough artist Halsey gets a coveted second-line slot on each Saturday, while 90s-and-early-aughts punk-rock favorites Rancid will be playing each Sunday (Tim Armstrong, the band's leader, played backup for Jimmy Cliff a couple of Coachellas ago), as will punk progenitors The Vandals. And hip-hop fans will no doubt turn up not just for A$AP Rocky and local legend Nosaj Thing, but also for Ice Cube's Saturday set to see if he brings out any of the other members of N.W.A. (who were an early rumor to reunite at the fest) to the stage. Run The Jewels returns to the field this year, as does Gary Clark, Jr. and Edward Sharpe and the Magnetic Zeroes. In terms of local artists making the big jump, The Dead Ships are in small print on Saturday, and Meg Meyers will rock the stage on Sunday. There's also a mysterious "Despacio All Weekend Long" at the bottom of the lineup -- that's a sound system setup with LCD's James Murphy and mash-up artists 2 Many DJ's. Tickets go on sale Wednesday at 11am at Coachella.com. 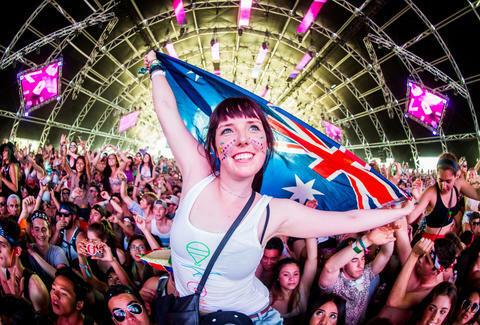 Jeff Miller is Thrillist's LA editor and has been to every weekend of Coachella (including double weekends) since 2001. Track him down at @jeffmillerla on Instagram and @ThrillistLA on Twitter.